One of the problems with the conventional type of steam locomotive is the presence of forces caused by the pistons, piston-rods, crossheads etc moving back and forth. As these masses are accelerated and decelerated, the reaction forces cause the locomotive to also accelerate and decelerate by a much smaller amount; it is still enough to make the riding rough and uncomfortable. These forces do not cancel as the two side of the locomotive operate 90 degrees apart to prevent dead-centre problems. At least two designers appreciated that a good way to obtain good balance for both the rotating and reciprocating masses was to fit two pistons on each side, driving crank-pins set at 180 degrees so that one piston would move forward as the other moved back. The only real difficulty was fitting two cylinders where one had grown before. Burch solved the problem by having two pistons in one cylinder, driving two different wheels. John Haswell solved it by fitting one cylinder above the other, set at a slight angle. Shaw had enough room to put two cylinders side-by-side. This drawing is taken from a patent granted to Richard Burch of Heywood in 1837. On each side there is an oscillating cylinder C - C with two opposed pistons; horizontal reaction forces would have cancelled out, but not vertical ones. Balanced drive however does not appear to be the aim. Burch's motivation seems to have been simply the driving of both axles without the use of a connecting rod, though why that would be inferior to this more complicated arrangement is not clear. No balance weights are visible on the wheels. I have so far found no indication that this design was actually built. Burch was described as 'a machinist' which does not sound like he was a professional railway engineer. Full details were published in the London Journal of Arts & Sciences, Volume XI, 1838. This remarkable locomotive had two cylinders on each side, angled slightly so that both piston rods aligned with the centre of the driving wheel. It was designed by John Haswell of the Austrian State Railway Works at Vienna and was exhibited in the International Exhibition of 1862. John Haswell had previously built the "Vindobona", one of the competitors in the famous Semmering locomotive trials in Austria. The cylinders were 10.8 inches diameter by 24.8 stroke, and the driving wheels were 7' 9" in diameter. Shaw's four-cylinder balanced locomotive was modestly called the H F Shaw ; it was built by the Hinkley Locomotive Works in 1881. It was advertised which as being completely free from the pounding and oscillating action of conventional two-cylindered engines. 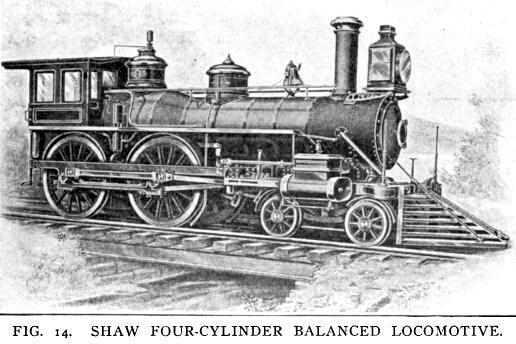 This locomotive also had two cylinders on each side, but mounted beside each other, a solution that was probably only made possible by the larger American loading gauge. These drove crank pins diametrically opposite each other on the driving wheel. One of the crank pins connected outside the driving wheel at the same position an ordinary crank pin would be located, and carried a double crank, the middle of which was supported in a bearing held in an outside frame. The connecting rods worked either side of this bearing. The engine was equivalent to one with two cylinders 16" by 24", and driving wheels 63" in diameter. The weight in working order was given as 74,000 pounds, of which 25,600 pounds was on the front bogie. The engine was said to have been well-designed and well-built, and it saw considerable trial use in revenue-earning service, where it was said to have worked "quite satisfactorily", but no more of the type were built. The history of this 2+2+2+2 locomotive is rather obscure. 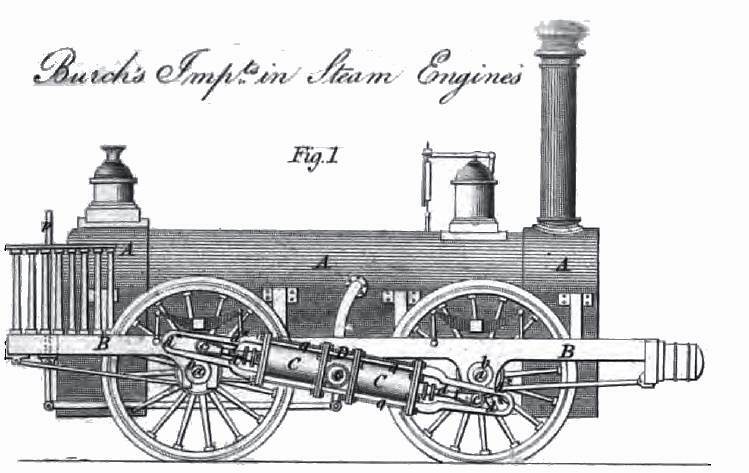 It derives from the last patent taken out by Thomas Crampton, though it has little in common with what is normally though to be a Crampton design- ie all the drive coming from a single pair of wheels at the rear of the locomotive. Left: Side view of Crampton Locomotive for Woolwich Arsenal: 1880's? On each side of the locomotive a pair of cylinders drove a single wheel, with the cranks set at 180 degrees. This sounds like a recipe for dead-centre problems, but presumably it was very unlikely that both sides of the locomotive would be on a dead-centre at the same time. Why the potentially difficult duplex-drive was adopted is uncertain; it would seem too late in locomotive development for people to be afraid of mysterious power-losses in coupling rods. Further research has shown that a steam operated 'starter' was fitted that could operate on the leading axle to avoid dead-centre issues. 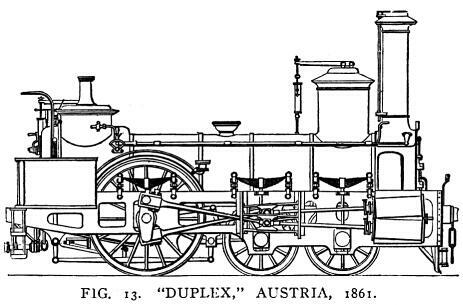 Crampton took out a patent for a balanced duplex-drive locomotive in 1885. It is claimed that a locomotive built to this design, or very similar, was in use at the Royal Arsenal at Woolwich in the late 1880's. However there is no reference to a locomotive with a 2+2+2+2 wheel arrangement on the Wikipedia page for the Royal Arsenal Railway. It is known that Crampton did experiments with the 18in-gauge locomotives Vulcan (No 939) and Mercury (No 1075) but both these engines were of 0-4-2 wheel arrangement. Ten 2-4-6-2 (151A) compound locomotives were built in 1932 for the Paris-Lyons-Marseilles company (PLM) to haul heavy goods trains on the 0.8% grade between Les Laumes and Dijon. The low-pressure cylinders drove the first set of coupled axles, and the high pressure cylinders the second set of axles. The two sets of drivers were linked with inside connecting rods and inside cranks on the 2nd and 3rd driving axles, so despite having separate groups of cylinders these locomotives were not true duplex, but actually 2-10-2. The front and back crankpins were set at 180 degrees so the back and forth forces from the movement of the pistons was balanced out. The 151A was therefore a balanced locomotive. 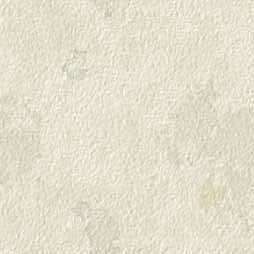 The 151A is described on the duplex drive page. These are the only balanced locomotives I have found so far. If there are more they are well-hidden. The only conclusion seems to be that the added complexity outweighed the smoother riding and reduced track impact. Since the words "hammer-blow" recur like a dismal refrain in the history of locomotive design, this is rather hard to understand.